What steps are involved in laying out a primary pathway? Laying out a pathway can seem complicated and overwhelming. Following the provided steps should simplify the process and produce a more successful result. This post addresses laying out primary pathways, which are the most challenging. The procedure can also be applied to smaller, secondary pathways, if necessary. For more information on pathways check out the rest of the Green Desk pathways posts. 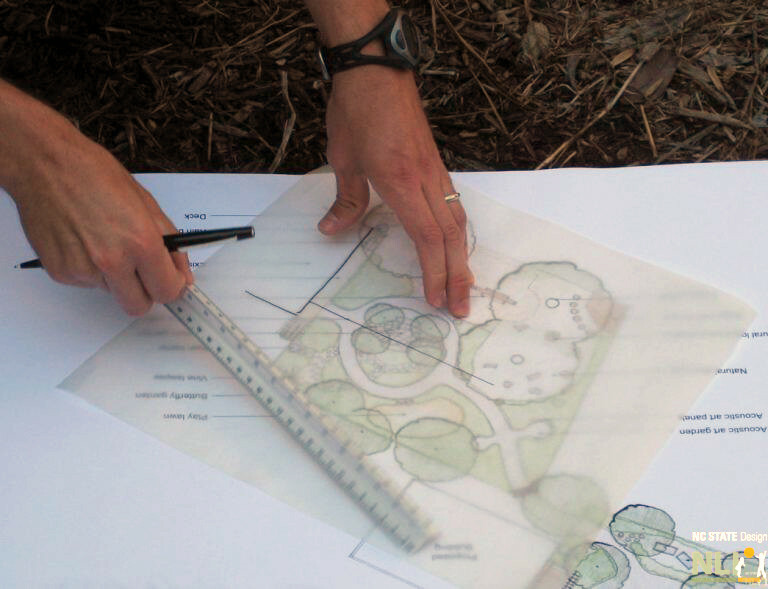 Using a pencil and the scale as a straight edge, mark the point of beginning (A) and baseline on the plan. All other dimensions and measurements will be taken from the baseline (red line in Figure 1). There are two common ways to setup a baseline. 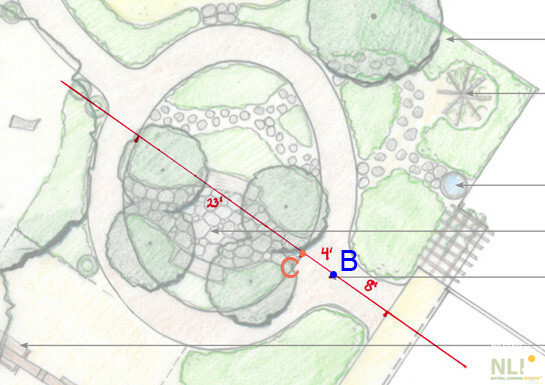 Option 1 (preferred): Use the exterior wall of a building as the baseline or a line projected perpendicularly from an exterior wall of the building. Option 2: Use a straight, immovable object, such as a fenceline, as the baseline or project a line perpendicularly from the straight, immovable object. Use the right angle of any square object (a sheet of paper, cardboard box) to make sure the baseline is drawn perpendicular to the object being used. Mark 5’ increments along baseline. Starting at the point of beginning of the baseline (A), use the scale to measure and mark 5′ increments along the baseline. 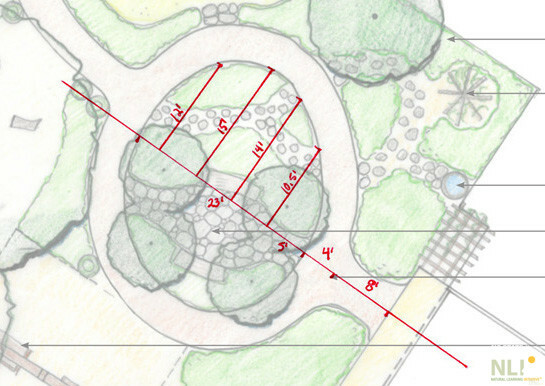 At each 5’ increment, measure the offsets from baseline to inside edge of pathway. Use the scale to measure and mark the offsets. Determine key dimensions along the baseline. Examples of key dimensions would be the intersection of two paths (B) or intersection of the primary pathway with the baseline (C). Repeat the steps above, but in real dimensions on the ground. This will transfer your measurements from paper to the site. Locate the point of beginning of the baseline. 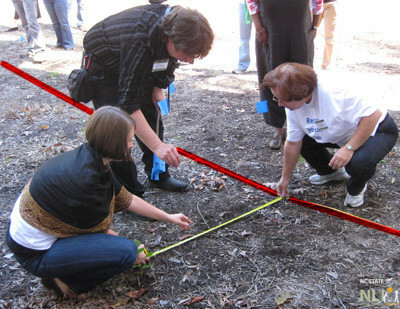 Start at the point of beginning and stretch the 100’ measuring tape or string into the outdoor learning environment. Be sure to keep it tight and straight. Use the 100’ measuring tape to temporarily mark the baseline. To guarantee that the measuring tape is perpendicular to the building, follow these basic steps. Measure equal distances along the baseline and building. The distance between these points should be the same length on both sides of the baseline. If measuring from a corner, verify that the baseline is perpendicular using one hypotenuse only. Measure 20’ along the baseline. Mark point A with a survey flag. Measure 20’ along the building in either direction of the baseline. 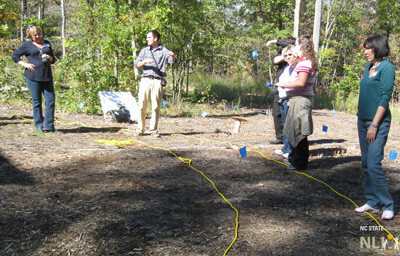 Mark points B and C with survey flags. The distance between points A and B (hypotenuse 1) and the distance between points A and C (hypotenuse 2) should be the same, 28’ 3”. Adjust the angle of the baseline until these dimensions are the same. Once final, mark baseline with marking chalk. Mark key dimensions along the baseline with survey flags. 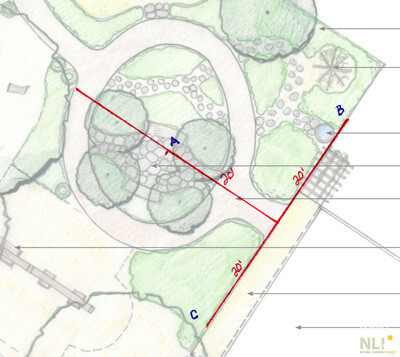 At each key dimension, measure from baseline to inside edge of pathway. 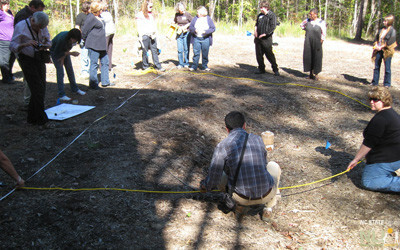 Mark each point with a survey flag. Note that the baseline is highlighted in red. Mark 5’ increments along baseline with survey flags. At each 5’ increment, measure the offset from baseline to inside edge of pathway and use survey flags to mark the location. 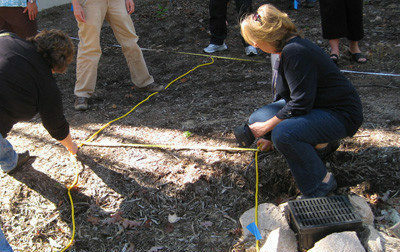 Use a garden hose or rope to layout the interior edge of the pathway along the line of survey flags. Make sure curves are smooth. Using a measuring tape, offset the inside edge of the pathway to desired width and mark the outer edge of pathway with survey flags. 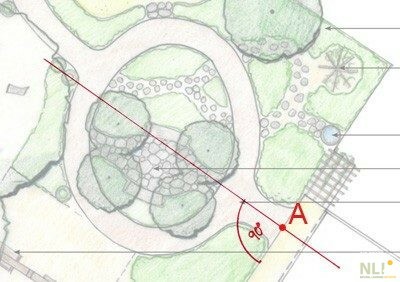 Use a garden hose or rope to lay out the outer edge of the pathway. Again, make sure curves are smooth. Verify key measurements, i.e. between path and fence, and make necessary adjustments. Mark the edges of the pathway with marking chalk.